Previous archaeological research has established that there was a thriving trade in metal objects throughout Europe. Indeed, the urn that the remains were found in was also from Central Europe. Until now, however, there wasn’t any evidence of textile trade. The origin of the goods is determined by measuring the levels of strontium isotopes in the material. Different geographic regions have different levels of strontium, so by examining those isotopes, archaeologists are able to figure out where materials originated.The age of the cloth was determined by Carbon-14 dating. What’s particularly interesting about this cloth is that its weaved from nettle, rather than the flax and hemp that were more commonly produced. 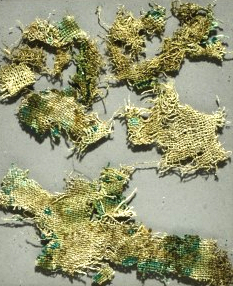 This suggests that that the cloth was a luxury item – the Bronze Age equivalent of silk. What’s unclear, though, is how the textiles got to Denmark. It may be that there was a trade in nettle cloth – something that further research might be able to determine if more samples of the textile are found in other sites. Alternatively, it’s possible that the person who died did so in Austria, and his remains were then returned to Denmark. Ohhh and finding JESUS’s face imprinted on this shroud now that’s crazy ! If you have all of that then you have DNA a blood or hair sample intertwined in it , skin cells or something why go that far ? please don’t get upset if your catholic im just venting! Hi Ice Angel. I don’t think we Catholics (I’m Episcopalian, but that’s close) or any of the many Baptist, Presbyterian, Lutheran, Methodist, Greek Orthodox, Non-Denominational Evangelical and Jewish people I know who think the shroud is real are upset. Really we’re not. Oh, and all pieces of cloth from the first century were not the same just as all sandals were not. Many experts think the shroud is real and for many good reasons. 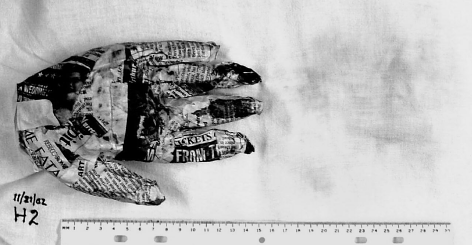 In one experiment with a heated paper mache hand, Ray Rogers noted in his book that “Convection decreased resolution … however, the thumb and one finger are clearly resolved.” Is that sufficient resolution no bigger than a little finger? Rogers shows us just such an image in his book. Rogers, on the same page, suggested some important variables, namely, body temperature, rate of amine release, a cool and still test bed and a sufficient concentration of saccharides. I suspect there are many more variables including body chemistry, time and other ambient factors such as humidity. These are good starting points for Denis Mannix. However, I think something else is involved. Perhaps it is a condition or a phenomenon none of us has thought of including a touch of miracle. The amine/saccharide experiments showed that the following variables are important 1) When the body" temperature is too high, convection cells are too active, diffusing amines too widely for good resolution. Resolution improves at lower temperatures. A body that had cooled for several hours but has not yet produced high concentrations or amines would give better resolution than a hot body. 2) The amines must be released slowly. Too much amine badly reduced resolution. A decaying body would give much better resolution than any object that had been painted with pure amines. Too much amine would color the entire cloth, obliterating the image. A successful image that involved a real body would require removal of the cloth before extensive decomposition. 3) The experimental assembly must be kept in a space that is cool and still. 4) An increase in the concentration of reducing saccharides (impurities) on the cloth improves resolution. 5) Modern linen that does not contain suitable impurities will not produce an image. The picture shown is the one from Rogers’ book. It was obtained from previews in Google Books. A larger version with better resolution is available in the book. Templecombe: It is almost too exciting to think about. In August we had a talk, which lived up to the promise of its title, The Knights Templar. The speaker, Juliet Faith, began with a brief history of those armed monks, founded in 1118 on the continent, to protect pilgrims to the Holy Land. They became so powerful and rich that they were hounded out or executed in 1307. All their treasures disappeared overnight and many of the knights fled to England where their lives were spared and where they continued as before, setting up preceptories everywhere. Because of their strong links with the Holy Land, they were guardians of a huge number of sacred relics. 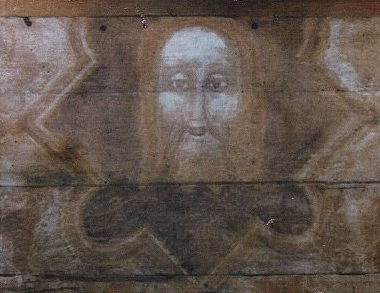 During the Second World War, a panel painting was discovered, well hidden in the roof of a cottage in Templecombe, the most important preceptory in the South West. The panel bears an uncanny resemblance to the head on the Shroud of Turin, carbon dated to 1280. The Templars had been tried for worshipping an idol in the form of a head, so could the panel have been the lid of a box containing the shroud? It is almost too exciting to think about. The nearly finished frescoes that stand outside St. John’s Lutheran Church in Stacy are a sight to behold. 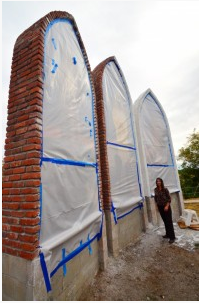 An image of the Transfiguration of Christ is portrayed across three towering arches that overlook a scenic section of Carlos Avery State Wildlife Refuge. Jesus stands in the middle with the prophets Elijah and Moses at his side. The outdoor frescoes – the first completed by anyone in over 700 years – are the works of world-renowned artist Mark Balma, who has family in the Stacy area. The frescoes will be officially revealed to the public Sept. 29 at 6:30 p.m.
Balma’s rendering of Christ is unlike any image ever painted or sculpted of him, due to the process Balma went through to create what he seems to be the most accurate representation of Jesus ever made. Balma worked with computer graphics artist Ray Downing of Studio Macbeth to design the image of Christ. Those familiar with the Shroud of Turin might know of Downing. In March of 2010, the History Channel released a two-hour documentary about the shroud, a 14-foot length of cloth believed to be the actual burial shroud of Jesus. A face, believed to be that of Jesus, is imprinted on the shroud. Using the fabric and the aid of computer imaging, Downing produced a three-dimensional image that Balma used to create the “most historically accurate” rendering of Christ ever produced, Welty said. Welty said Balma actually modeled Elijah after a man he met in a restaurant. Well, not the parts about Moses and Elijah. But that is interesting. VATICAN CITY — The Vatican newspaper has added to the doubts surrounding Harvard University’s claim that a 4th century Coptic papyrus fragment showed that some early Christians believed that Jesus was married, declaring it a "fake."